Lincoln (population 248,744) began as the village of Lancaster in 1859. The community had fewer than 40 residents when Nebraska was declared a state in 1867, but nevertheless Lancaster was renamed Lincoln and chosen as the state capital. Omaha, the state’s largest city and former territorial capital, was viewed as too remote from the rest of the state in its location on the eastern boundary, so the more centrally located Lincoln was chosen. A substantial site was platted for the capital, with wide streets, parks, and a campus for a yet-to-be-founded state university. The location of the state government in Lincoln, as well as other major state institutions like the University of Nebraska and the penitentiary, brought new economic activity to the area. Lincoln’s population of 2,500 in 1870 grew to 13,000 by 1880 and burgeoned to 55,000 by 1890. Lincoln annexed several adjacent communities in the 1920s to reach a population of 80,000 by 1930. Lincoln’s stable, diversified economy and its roles as state capital and home of the University of Nebraska lead to a very steady population growth throughout the 20th century. Major industries today, besides the government and the university, include insurance, printing, food processing, brick making, and pharmaceuticals. Lincoln’s Haymarket Landmark District, consisting of 19th and early 20th century wholesale houses, was named a local Landmark District in 1982 and was federally certified in 1983. It has become a destination for Lincoln visitors and residents alike, as well as a vibrant business and residential neighborhood. 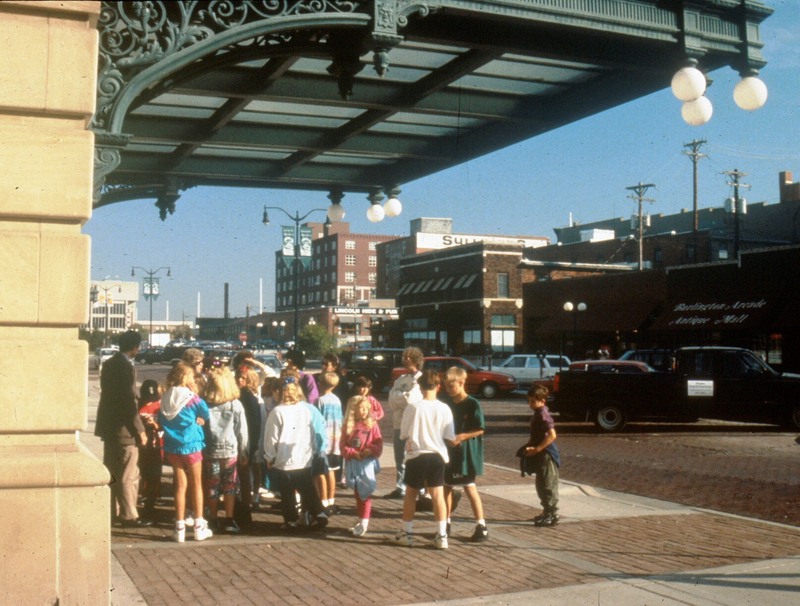 Historic Haymarket, Inc. has led the renaissance of the area, following the principles of the Main Street program. Several adaptive re-use projects have created new housing units and business spaces. A recent city-funded streetscape project carefully balanced the need for sidewalks, traditional on-street parking, and vehicular access, while preserving historic loading docks. Many of these docks now serve as outdoor dining areas. Haymarket serves as the site for several major events, but the largest is the Farmers Market. Held Saturday mornings from May to October, the market attracts up to 150 vendors from throughout the region and 5,000 to 8,000 visitors weekly. Some of Haymarket’s newest permanent businesses had their start as Farmers Market vendors. Lincoln has a number of groups that work to protect the city’s cultural heritage. The Preservation Association of Lincoln has produced monthly lectures on local history and preservation since 1993 in partnership with the Nebraska State Historical Society. For the past few years, these programs have been broadcast on the city’s government access channel. Wyuka Cemetery’s Historical Foundation offers tours both for the general public and a program for eighth grade students. The students receive a tour that emphasizes Lincoln’s historic diversity, local connections to world events, and Civil War history. The Near South Neighborhood Association has offered a biennial Mother’s Day Tour of Homes since the 1970s. The most recent tour, in May 2007, attracted more than 1,000 visitors to seven historic homes. In addition to raising money for the association, the tours also promote Near South as an attractive residential neighborhood and encourage home ownership.